Save 15%* During Our Earth Day Sale! Use Code GREEN15. Ends 4/29. Free Shipping anywhere in the U.S. or Canada. Autoship every 1 Month 2 Months 3 Months 6 Months 6 Weeks and save 15% on your first order! What's this? The Autoship program allows you to have your items conveniently delivered to you at the frequency you choose. Every Autoship order ships for FREE, includes our 180-Day Money Back Guarantee, and has a 15% discount on the first order! You can change your subscription or cancel at any time. Read all program FAQs here. Free Standard Shipping anywhere in the United States or Canada. We pay for the return shipping costs if you are not 100% satisfied. You have 180 days to try out the product. Support Your Health With Detox Foot Pads! What are Detox Foot Pads? 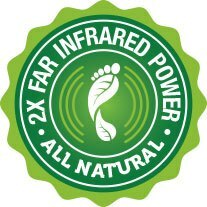 What are the benefits of Detox Foot Pads? Trying Detox Foot Pads is risk-free! We get over 120,000 daily visitors and have served over 2 million customers. We have over 1,000 affiliates worldwide. There are over 1,000 doctors worldwide who distribute and promote our products. Formulated with bamboo extracts, herbs, and gemstones and developed through years of medical research in Japan, these organic detox foot pads are specially designed to aid your body in toxin removal by stimulating reflexology zones. Apply Detox Foot Pads to both feet before bed and let them work while you sleep. See the results in the morning and experience the benefits of cleansing from the inside out! Every day, your body is assaulted by an onslaught of harsh toxins in the water you drink, air you breath, food you eat, and environment in which you live. When toxins accumulate over time, they strain your health and wellbeing. Clearing your body of toxins may help you live a stronger and happier life. Detox Foot Pads are designed to draw toxins out of the body by stimulating reflex points on the bottom of the feet. Contains high quality, pure bamboo vinegar extract to ignite the removal of toxins. Encourages a positive mental state. Safe, effective, and easy to use. Disposable, no mess! If you are not satisfied with your results, just let us know and we’ll send you a prompt refund. Why are These Detox Foot Pads the Best Available? These are the FIRST detox foot pads made with all-natural, premium, organic ingredients. Carbon-titanium adhesives boost effectiveness by increasing bio-electricity. Tourmaline emits far infrared energy to support the nervous system. 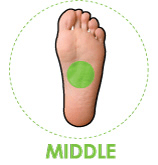 Stimulates the Kidney 1 Meridian point on the sole of the foot to promote detoxification and relieve tension. Protective mylar bags defend against harmful radiation during shipping. Recommended by the Japanese Society of Preventive and Alternative Medicine. Manufactured according to Good Manufacturing Practice standards. Each package contains 10 patches for a 5-day cleanse. 1. Are Detox Foot Pads all natural? Detox Foot Pads are made with organic ingredients and specifically designed to aid the body in removing harmful chemical and toxic metals. 2. How do Detox Foot Pads work? Detox Foot Pads work on the same osmotic principle used by the plant kingdom. Tree roots transport water up to branches through semi-permeable membranes. Similarly, detox foot pads cause the skin to perspire and then draw circulating toxins from the bottom of the feet. The new carbon-titanium adhesives are designed to increase the flow of bio-electricity and blood circulation around the pad to boost its effectiveness. The foot is where most of the nerves in the body end, making it the ideal location to clean out toxins, chemicals, and toxic metals which can be expelled through the sweat. 3. What is Reflexology? Reflexology is an ancient healing art that uses reflex points on the bottom of the feet to activate organs and systems throughout the body. It's believed that stimulating these reflex areas can promote health in the corresponding organs and systems through energetic pathways. By placing our detox foot pads on the reflex points, they will energize, stimulate and detoxify your body. Use the foot reflexology / acupuncture chart below to view the reflex points on the bottom of each foot. Use only one foot pad on each foot per night. 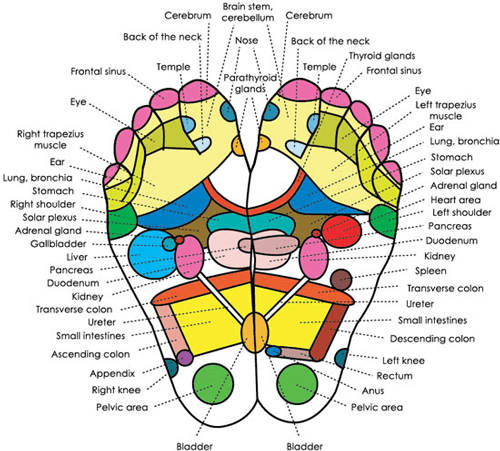 Refer to the reflexology chart to select the organ or area you want to cleanse. Begin by applying the pads to the arches of your feet first. 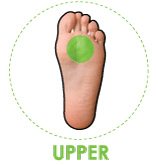 Affix sideways or lengthwise to the upper (ball), middle (arch), or lower (heel) portion of the bottom of each foot according to the organs or reflex points you wish to detox or stimulate. Pads can be applied either lengthwise or sideways in order to maximize surface area. It is recommended to detox the middle portion (arch) of the foot first. Press gently to insure the pad is secure. Wear a light sock over the detox foot pads to avoid accidental displacement. Pads should be left in place for 8 hours or until they become discolored. Stay hydrated with purified water to help flush toxins from your body. Get Started Today and Boost Your Health and Wellness With Detox Foot Pads... Or Your Money Back!! A patented form of processed zeolite proven to effectively detoxify metals in humans and reduce the speed of cellular oxidation. Derived from the outer wall of spores and grains, binds like a sponge to toxic metals, toxins, and pesticides. Supports circulation and produces an osmotic effect that promotes the transport of toxins across cell membranes. Helps discharge undesired waste matter from the body. Incredible wellness promoter, grows in the Brazillian red clay with no artificial cultivating processes. Semi-precious stone and mineral that gives off negative ions and far-infrared rays to help relieve stress and increase alertness. Like Tourmaline, amethyst gemstone emits negative ions; amethyst exerts a cleansing and liberating energy upon the nervous system, promoting a clearing and stabilizing effect. Absorbs toxins and binds together the other ingredients. An herb containing several beneficial acids and vitamins. Stimulates secretion of toxins into the foot pad. Recognized for generations for its strong toxin absorbing properties. Contains alkaloids that aid in drawing waste into the foot pad. Apply one Detox Foot Pad to the sole of each foot before bed, every night or every other night to aid your body in chemical and toxic metal cleansing. In the mornings, you'll see the results of the toxins that were drawn from your body while you slept. Simply peel off the foot pads to see that they're discolored, dark brown, hard and bumpy, yellow, or gray in color, with the toxins they've collected. After repeated nightly applications, depending on your body, you may see that when you remove the pads, they're not as discolored; this is a clear indication that your toxin load is being reduced. The results are dependent upon the strength of your immune system, the efficiency of your elimination systems, as well as your toxin load. Typically, the clearer and drier the foot pads are in the mornings, the nearer you are to the close of your cleansing cycle. Cleansing your body can take as long as 12 months but most people notice health improvements within weeks of beginning their first chemical and toxic metal cleanse. Apply pads once a week to the soles of the feet before bed. This will provide you with weekly cleansing to prevent the accumulation of toxic chemicals and toxic metals. For the complete chemical and toxic metal cleanse, view the instructions tab on the Chemical and Toxic Metal Cleanse Kit product page. Take one piece of the adhesive backing sheet and one detox foot pad. Gently peel off the backing paper, leaving the top piece attached for easier handling. Remove the detox pad from its protective packaging. Hold it with the Global Healing Center logos facing down toward the adhesive sheet. Carefully place the detox pad in the center of the adhesive sheet either lengthwise or sideways. Remove the remaining portion of backing paper and press the pad firmly to the adhesive backing. Apply the detox pad to the area of the foot (reflex points) you wish to detoxify. Press gently to ensure the pad is secure. Now repeat the process for the other foot. Once the application is complete on both feet, go to bed as normal. 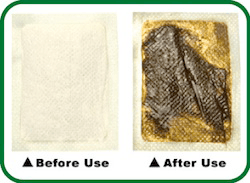 Pads should be left in place for eight hours or until the pads become discolored, hard or damp. Remove the used pads and discard. Avoid touching the dark part as this now contains toxins that have been drawn from the body during sleep. Thoroughly cleanse the feet. Please Note - pads may not be reused. Do not place detox foot pads directly over the eyes or on open cuts. If you have health concerns, please consult your physician before use. Are All Detox Foot Pads A Scam? Detox Foot Pads are manufactured with the highest quality ingredients, by Kenrico, a company with an impeccable record. By partnering with state-of-the-art research laboratories in the USA (USP, FDA level laboratory) and Japan, we're able to provide the best and safest Organic Detox Foot Pads on the market. Kenrico study investigating the capability of the pads at increasing alpha brainwaves and balancing alpha brainwaves between left and right brain. Foot Pad Manufacturing Patent #8,317,762 as approved by the US patent office. Watch this 9 minute infomercial to learn more about Kenrico produced detox foot pads. Watch this short video to learn more about the foot pads' carbon-titanium adhesives. *Exclusions and Limitations: This offer cannot be combined with other promotions or coupon codes. Offer excludes IntraMax, IntraMin, and IntraKid. Limited to ten of each item per customer. Excludes wholesale orders. Offer ends 11:59 pm CDT on 4/29/2019. Order processing may be delayed 1-2 days during this promotion. This discount may not be applied to any orders completed after the sale has ended or retroactively to any orders made prior to the start of the sale. Offer valid only on globalhealingcenter.com. Free shipping applies to orders shipped within the US & Canada only.